Have you ever paid off a credit card? What about the joy and relief you'd experience by paying off your home? Imagine you've helped someone accomplish that goal and the feeling you'd experience as a result of helping them focus their attention on solving their problem. That's what Travis Johnson has done over 400 times with his clients at Warrior's Wallet. No stranger to overcoming adversity, he's also had to personally overcome the instability of moving over 30 times before he graduated high school. Travis sums up his mission very simply, as his business helps people cut through the BS and misinformation surrounding personal finance to focus on the education and accountability needed to bring bedroom and peace to you finance. Travis started the journey to Warrior’s Wallet after a decade of helping others get their day-to-day finances in order. He’s helped hundreds of families pay off more than $6 million in debt. The perspective he provides bridges the gap between knowledge and action. University of Oklahoma Graduate and Navy Veteran Travis Johnson is the Books by Vets Vice President and Public Relations Director. He also serves on the board of the S.H.I.N.E Foundation and teaches Reboot Combat Recovery. Remember the last time you lost money? No, not a few dollars. Remember the gut-wrenching, helpless, and infuriating feelings that swarmed to your back and shoulders? Not exactly increasing your belief that you're capable of accomplishing more in your business or life, does it? There wasn't one event that set the foundation for Scott Carson of We Close Notes, but it sure set the trajectory in the right direction. Seeing dollar bills rather than asset lists, opportunity rather than struggle, Scott turned a $40k loss on one event into a MASSIVELY SUCCESSFUL real estate education process for folks to follow and learn from. If you'd like a feel-good, surface level guide to business success, then check out another podcast and don't spend the time to subscribe to this one. 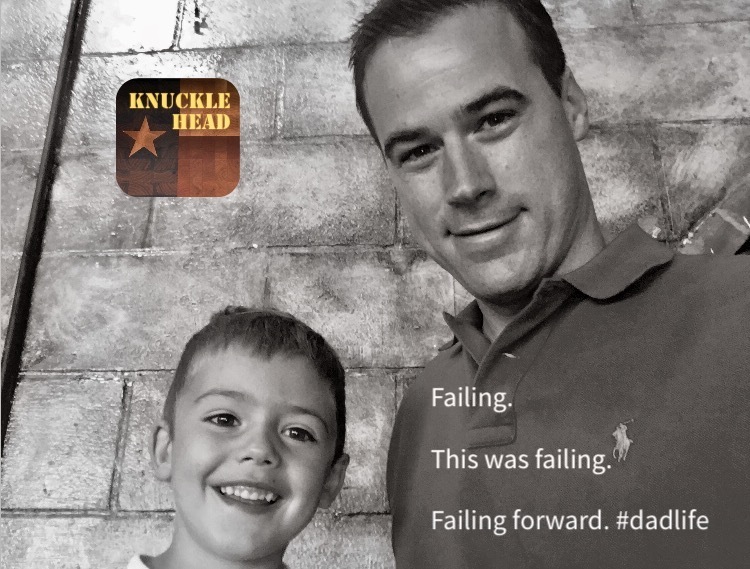 At Knucklehead, we want to bring you the stories of failure and mistakes that entreprenuers and sales leaders experienced that led to the success they're earned. Go out there and #getsomewins today, #dontbebeta in the process because when you experience the setback, what will your reaction be? We believe you will recover and be stronger than you were when the setback happened. What happens when your product gets picked up for distribution by a regional retail grocer? You've made it, right!? How about when you're thrust into a position to lead a business after being passed a family secret recipe? The answer simply is leadership. Being humble enough to say when you do not have the answer, but willing to listen to your mentors and work through the challenges associated with growth. Mutt's Sauce CEO Charlynda Nyenke Scales smoke checked this interview where she took the gloves off and kept it real on her journey to where they are today. Head on over to www.muttssauce.com to order your combo pack today! What is a “Recovering Principal”? Having spent seven years leading an exemplary elementary school campus in West Texas, Chris Shade refers to himself as a “recovering principal.” Despite spending only four years in the classroom prior, he was always a teacher. Now speaking with educators, students, and parents on fostering a growth mindset. In this episode, we diving into a largely unsuccessful and costly rollout at his school as a principal, and the nontraditional approach he took to making it right. Phoebe had just been asked to commit to a 48-hour turnaround on a leadership and development workshop. Only problem was, she hadn’t created any of the material. There’s no way she’d be able to pull off training a group of people, let alone teams of folks in that short of a time. What did she do? What would you have done? Since killing it at that first training, Phoebe Mroczek has continued to bring value for her clients with digital marketing strategies, podcasts and helping hone their tone of marketing campaigns. She hosts a widely popular podcast, Unbecoming, and has been featured all over the media landscape to include Inc, New Media Summit and more. Do you live your core values? Have you experienced the pain of a setback so intensively that you had to change? Do you ever want to make a different decision when your core values are displayed, but your choices tell a different story? It’s called being confused. The literal first step to clarity is confusion. Most folks don’t take the time to stay in it or analyze that they are responsible for putting themselves there. Alcohol, shying away from responsibilty, mistakes in the military caused Chris Perez to examine why he was in the situation he was in. He decided to pour his life into writing and expression that would help people face the darkness of inauthenticity. Every one of us have those challenges that cause us to tuck our tail and run. But, when you press in, like Chris talks about in this episode, you can face the darkness and not shy away from the fear. Start today and live your core values - those that follow need to have a leader like you win each day. You probably like paying taxes. Indirectly, it does mean you're making money. However, it doesn't mean just because you make money that you have to give it all to Uncle Sam. Business owners, 1099 Sales folks, and other various entities year after year are provided with solutions that are half-baked, well-intended, user-friendly but ultimately confusing. CPA's, web-based or big box tax solutions, consultants continue to swing and miss when it comes to reducing your liability. Insert a guy like Chance. After tripping over a tax bill he accrued while selling licensed collegiate apparel back in college, he set a goal to know all he could about the tax code. Several stints with CPA's that were hog-tied to "business as usual", Chance stormed the beaches of social media with a non-traditional approach to help his clients win the battle of "not-knowing" when they're faced with the same situation he overcame back in school. He's linked together several case studies (for our audience only) and you'll be able to access those with a link provided on Tax Day for businesses, 2019. Rumor has it that he's starting a podcast to continue to drip some of the info regarding the tax code and time-tested strategies to win for you and your business. Connect with Chance via DM on Instagram also, mention "Knucklehead" and he'll set you up with a free 30-min consultation on how to help you with your taxes. Can you think of something more misunderstood and vague? Most folks don’t have a brand or have lived enough mistakes or under pressure enough to know themselves or what they’re made of. Well, that’s until they meet someone like Dr. Natalia Wiechowski. She’s been through not just a career transformation, but the sort of transformation that people who use that catchphrase would mean. With over 14+ years of experience in human behavior and social relationships, made the German Dr. of Philosophy and Social scientist come to the conclusion that personal branding is a prerequisite to design a dream life(style) and career of purpose. As a storyteller Dr. Natalia scored two viral posts on LinkedIn in 2016, which allowed her to build an international online community of over 150,000 followers. Her work was also featured in LinkedIn’s #InItTogether campaign in 2018. No wonder why people call her the Middle East's leading Edutainer. 2:02 - “Modern Leadership - I’m a doctor, so what?? 17:40 - How do you work with people who don’t think like you do? Unlearning unproductive habits to now lead two successful businesses, US Navy Veteran Mike “Doc” Rannigan has pulled himself from the depths of struggle and fought back. Learning from failure, struggle, and mistakes he’s learned to give back to the community that has provided so much for him. Serving as a member of the Rockwall Veterans Business Alliance, he’s helped provide exposure to businesses local to his community and provided veterans with jobs. Rolling up your sleeves and getting to work and faithfully being there for his wife of over 20 years and their children, Michael sets an example for many to follow. More to come here at Knucklehead Podcast, check it out on iTunes, Podbean, or your favorite podcast listening app on Google Play. Get your Knucklehead Podcast shirts at https://goo.gl/6FCiDW - Join the movement of not being a victim, choosing to win, and earning your place amongst those that have done the same. Have you ever experienced what it’s like to lose with the wrong mindset? They’re all the ways to describe why you aren’t going to achieve. But, it’s not losing or failing that's the problem. It’s how you think about it. Elevating your mindset is easier said than done, because your environment may not support the change you’d like to experience. Your support system may be broke. Let’s face it, you may have been also. That’s where someone like Nicholas Bayerle comes in. As a man, his belief calls us to be more tomorrow that what we were today. He’s been named a Top 21 Influencer and Top 30 under 30 Influencer, featured in Forbes, Order of Man, He went from obese, broke and no girlfriend to now married to the woman of his dreams, fit, and thriving in business. Nicholas is an international speaker, podcast host and was rated top 30 under 30 influencers. He has worked with some of the top businessmen and is passionate about seeing men prosper in health, business and relationships. Nicholas has shared the stage with Lewis Howes, Cole Hatter, and Jordan Harbinger and been interviewed on the top business podcasts. He is creator of the #1 annual businessmen’s event, Billion Dollar Body Live and has curated a successful community of men called The Billion Dollar Brotherhood.